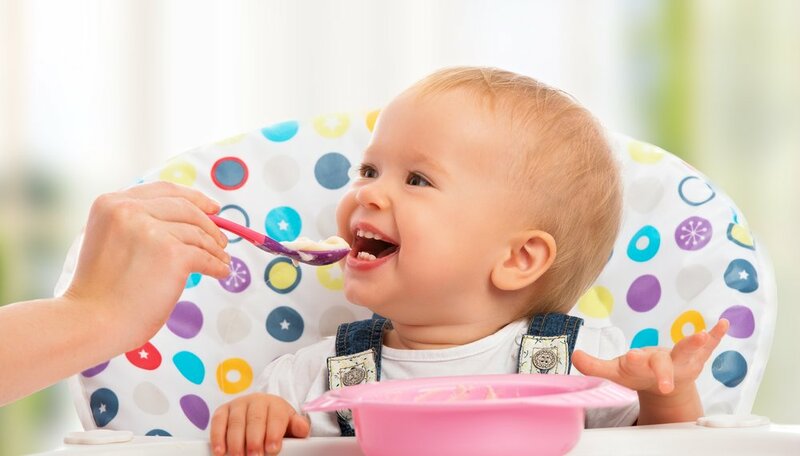 If you believe that your baby is ready to begin eating solids, ask your pediatrician about it. Introducing solids to your baby’s diet is extremely important because, this way, he will acquire the nutrients needed for a proper development. You might be wondering what’s the right time to begin. According to the American Academy of Pediatrics, it’s around the 6-month mark; however, every child is different and some are ready before that. It’s important to introduce solid food when your baby is around 6 months because at this point breast milk no longer provides enough iron, calories, protein, DHA, zinc, and fat-soluble vitamins such as folic acid, vitamin B12, vitamin D, and vitamin C. These requirements can be found in solid food. How to introduce the first solid food? To begin with this new stage, choose the time of day that’s more convenient for you. Preferably, choose between breakfast, lunch, or dinner time, and alternate them as time passes, so that your baby gets used to eating solid foods at different times of day. You want your baby to be in a good mood and hungry enough, but not starving. To make eating solids for the first time a smoother experience, give your baby a little breast milk or formula first. Then try giving him very small spoonfuls of food and end with more milk. After several days, the process can be reversed to ensure that, gradually, the nutrients coming from the solid foods are increased, until the point where you only provide solids at that specific mealtime. When you are ready to start, sit your little one in a well supported position. Choose any food you want to begin with, just make sure that it is fully pureed, without any chunks, and it’s not seasoned. You can choose to prepare it at home or buy it. Take one of your baby’s spoons and just fill it halfway. Feed it to your baby and talk to him about it. How is he reacting? It is normal for your baby to show confusion, and he may even refuse the food because this is all completely new to him. Don’t worry about it! Start slowly, with a small spoonful or two. Soon your child will become used to this new way of eating and you can gradually increase the amount of food he eats. If your baby cries or moves away, don’t forcefully feed him. Return to his previous diet of breast milk or formula for a few days and then try again. The transition to solids is a gradual process where your baby will still be getting most of his nutritional intake from breast milk or formula. When you introduce solids, remember to try each new food for 3-5 consecutive days to verify that your little one shows no allergic reaction; it will be easier to identify it that way. Alternate food after a few days, so your baby doesn’t get used to only one flavor. For example, you can try offering meat for 3 days, cereal for 3 days, vegetable for 3 days, fruit for 3 days, then other kinds of meat for another 3 days, and so on until your little one tries a large variety of foods.